Small-format portrait definitive Cyprus stamps were discontinued in 1928. They were permanently replaced by larger-format pictorial definitive and commemorative postage stamps that would better reflect the history and culture of this island nation. 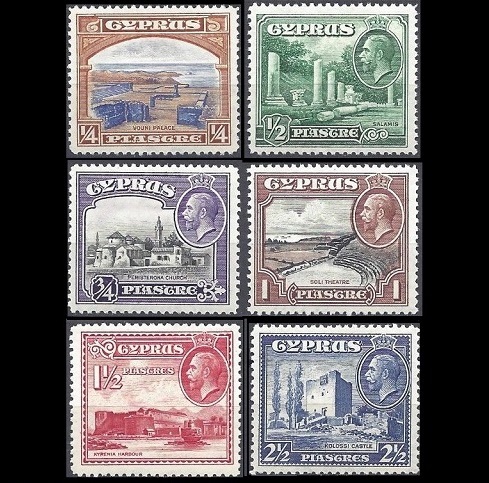 The ten commemorative Cyprus stamps shown above (Sc. #114-123) were issued on February 1, 1928 to celebrate the 50th Anniversary of the British Government of Cyprus. These stamps are all engraved, perforated 12, and they are printed on paper with the Multiple Crown and Script CA watermark. Individual descriptions are as follows. 3/4 Piaster -- Silver coin of Amathus. Amathus was once one of the ancient royal cities of Cyprus, flourishing, at its height, between 600 BC and 300 BC. One of the most important of the temples of Aphrodite was located there. The coin shown on the stamp is from the early 5th Century BC. By the time of the Third Crusade (1189-1192), Amathus had been almost completely abandoned. 1 Piaster -- Zeno of Citium. Zeno of Citium(334-262 BC) from Citium (Kition) was a Hellenistic philosopher of possible Phoenician origin. He was the founder of the Stoic School of Philosophy, which he taught in Athens after about 300 BC. 1 1/2 Piasters -- Map of Cyprus. 2 1/2 Piasters -- Discovery of the Body of St. Barnabas. Barnabas, born in Cypress, was an early Christian, becoming one of the prominent disciples in Jerusalem. He later traveled with St. Paul, converting the Gentiles of the Eastern Mediterranean. Barnabas was martyred in Salamis in AD 61, and he is considered the founder of the Cypriot Orthodox Church. Tradition states that in 478, Barnabas appeared to the Archbishop of Salamis, revealing the location of his sepulcher beneath a nearby Carob tree. The Archbishop found the remains of Barnabas and a manuscript of the Gospel of St. Matthew in the sepulcher located there. 4 Piasters -- Cloisters of Bellapais Abbey. Bellapais Abbey is the modern-day ruin of a monastery built during the 13th Century near Kyrenia. When the Ottoman Turks conquered the island during the late 16th Century, they gave the abbey to the Cypriot Orthodox Church. The church, however, over the ensuing centuries, allowed the abbey to fall into ruin. Today, it serves as a museum. 6 Piasters -- Badge of the Colony. 9 Piasters -- Mosque of Umm Haram at Larnaca. Umm Haram bint Milhan was an elderly female relative and traveling companion of the Prophet Muhammad. Later in her life, during the Moslem conquest of Larnaca, Cyprus, in 671, Umm Haram fell from her horse. She died from her injuries, and she was buried in a shrine there. In 1760, a mosque was built near her grave site, and it would become known as the Hala Sultan Tekke or the Mosque of Umm Haram. 18 Piasters -- Statue of Richard the Lionheart in London. King Richard I, also called Richard the Lionheart, was the King of England from 1189 to 1199. In addition to his English and French titles, he was also called the Lord of Cyprus, resulting from his conquest of Cyprus during the Third Crusade. 45 Piasters -- St. Nicholas Cathedral in Famagusta. The Lala Mustafa Pasha Mosque, formerly known as the St. Nicholas Cathedral and the Saint Sophia Cathedral, is a 13th Century Roman Catholic Cathedral located in Famagusta. After the Ottoman Empire conquest of Cyprus in 1571, it was converted to a mosque, which it remains to this day. The nave and transepts remain, but in line with Moslem cultural tradition, it was stripped of all iconography, artwork, altars, and tombs, shortly after the conquest. 1 Pound -- Portrait of King George V.
The ten large-format pictorial definitive Cyprus stamps shown above (Sc. #125-135) were issued on December 1, 1934. These stamps are all engraved, perforated 12 1/2, and they are printed on paper with the Multiple Crown and Script CA watermark. 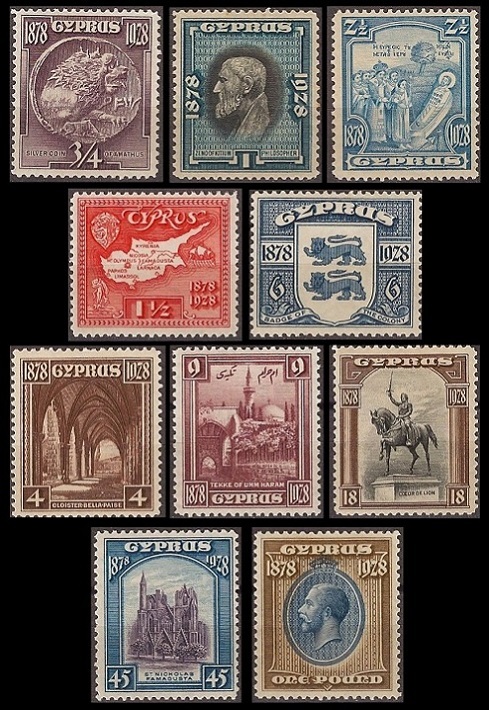 The individual descriptions of these pictorial definitive Cyprus stamps are as follows. 1/4 Piaster -- Ruins of Vouni Palace. Vouni Palace is a royal palace of the Persian Imperial Period. Located on a hilltop above Morphou Bay, it was built in about 520 BC and destroyed in 380 BC. The palace contained royal audience chambers, courtyards, bathhouses, and stores. 1/2 Piaster -- Columns at Salamis. Salamis is an Ancient Greek City-State on the Eastern Coast of Cyprus. Founded in the 11th Century BC, the city-state flourished until the 4th Century AD, when it was partially destroyed by earthquakes. The city was finally abandoned during the Moslem invasions of the 7th Century AD. 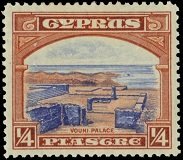 The columns shown on this Cyprus stamp are those of the Gymnasium of Salamis. 3/4 Piaster -- Peristerona Church. Peristerona is a village near Nicosia, whose population is made up of both Greek and Turkish Cypriots. The "Peristerona Church" consists of the St. Barnabas and Hilarion Church and the nearby Peristrona Mosque. The subject of this Cyprus stamp is intended to symbolize the peaceful co-existence of the Greek and Turkish populations of Cyprus. 1 Piaster -- Soli Theater. Soli or Soloi was an Ancient Greek city in Cyprus, dating back to the 6th Century BC. Most of the existing remains of Soli, basically the basilica and an amphitheater, are from the Roman Imperial Period. 1 1/2 Piasters -- Kyrenia Castle and Harbor. Kyrenia Castle is a 16th Century castle, built by the Venetians over a former Crusader castle. 2 1/2 Piasters -- Kolossi Castle. Kolossi Castle is a former Crusader fortress, originally constructed in the 13th Century. It is located in the village of Kolossi, near Limassol. 4 Piasters -- St. Sophia Cathedral. 6 Piasters -- Bairakdar Mosque in Nicosia. 9 Piasters -- Queen's Window, St. Hilarion Castle. St. Hilarion Castle is actually a 10th Century monastery located in the Kyrenia Mountains of Cyprus. The arch, known as the Queen's Window, offers a panoramic view of the road leading to Nicosia. 18 Piasters -- Buyuk Khan, Nicosia. This caravan terminus and inn complex, built shortly after the Ottoman conquest of the island, is one of the largest structures in Cyprus. 45 Piasters -- Forest Scene. 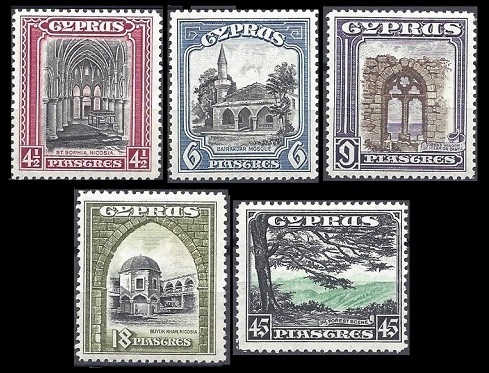 The four commemorative Cyprus stamps shown above (Sc. 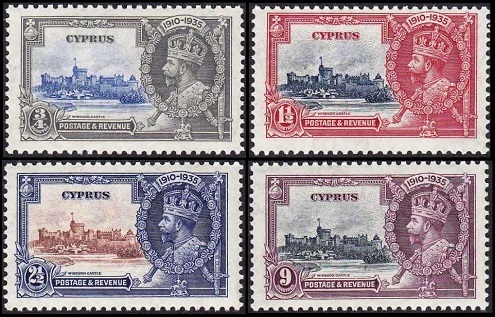 #136-139) were issued on May 6, 1935 to celebrate the 25th Anniversary of the Reign of King George V. These Cyprus stamps are all engraved, perforated 11 x 12, and they are printed on paper with the Multiple Crown and Script CA watermark.